There is good reason that Oliver in the South Okanagan is becoming known as Canada's "secret playground" for active retirees and young families alike. It's a place that offers the mild climate, outdoor activities, and recreation opportunities that simply don't exist elsewhere, and property here can still be purchased for bargain prices. Browse below for a better understanding of the amenities and economics that draws people in, and makes Oliver a great place for what we like to call "lifestyle investing." We want to personally invite you to see an amazing real estate market that provides cashflow, diversification, and what we affectionately call "lifestyle investing." Come join us in the beautiful city of Oliver, our discovery trips are designed to show you the market like nobody else can. Sure, Oliver is breathtakingly beautiful, the people are wonderful, and wait til you taste the food! But the real opportunity is the real estate investment potential. 2018 saw new construction sale prices as high as ever, and this year is starting off strong as well. How does that translate into real estate investment? That's what you have to come see! The timing for development has never been better, with the demand for new units continuing to outstrip supply, creating a compelling environment for investors. Come see for yourself, join us in person as we study the market, learn about the sustainable drivers, and tour the site and the city. Whatever people enjoy doing: skiing or snowboarding; enjoying wine and dining; hiking, cycling or mountain biking; boating; fishing or hunting; enjoying nature; attending live theater; participating in service clubs; gardening year long; educating your children; rock climbing; or any other activity imaginable, these are all available to the residents of Oliver. It is truly Canada's "best kept secret" and there is now a unique opportunity to purchase a piece of paradise early, before the world catches on and prices skyrocket. Check out the videos below touring various aspects of Oliver as a "lifestyle investment" destination. Oliver is becoming one of the newest upcoming destinations for wine, hiking, culture, family and relaxation. Read on to learn about the lifestyle that is attracting so many people to Oliver. 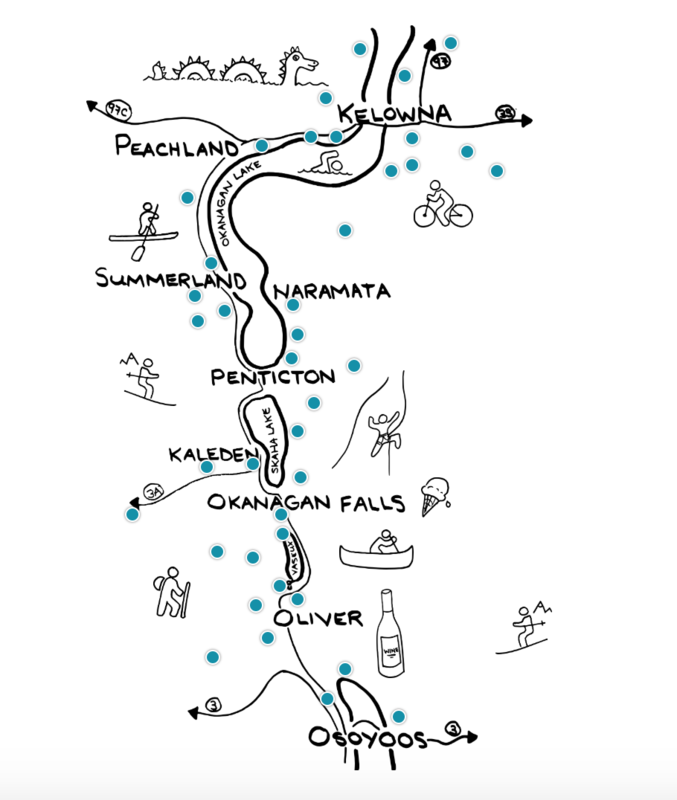 The International Hike and Bike Trail is a 20 km recreational trail that starts 5.5 km north of Oliver, BC and ends at the northern tip Osoyoos Lake. The trail follows the Okanagan River as it flows south to Osoyoos Lake and makes for a lovely way to explore the South Okanagan. There are many access points along this trail but the most popular one is located just off Highway 97 and Tucelnuit Drive. The turnoff is located just after the Esso Gas station if heading southerly (towards Oliver) or just after the river crossing if heading northerly (away from Oliver). After turning onto Tucelnuit Drive, take another right on Willow Court, the large paved parking lot will be visible on the right hand side. on local outdoor trecks and trails. Inspired by history, an adventure obstacle race was born that speaks to the many arduous tasks that farm hands had to perform in the dry blistering heat of Canada's only desert at the Fraek'n Farmer race. Learn more about Freak'n Farmer! In Penticton, 30 minutes north of Oliver, the 2017 Multisport World Champions Festival was held, with over 40 Countries from all over the world attending. YouTube V-logger "Life of Luke" made a great video for sample of the many hikes nearby. Approximately 8,636* souls call Oliver and the surrounding area home all year long. The residents of Oliver have a zest for life to be admired, and it's contagious! Approximately 8,636* souls call Oliver and the surrounding area home all year long. The residents of Oliver have a zest for life to be admired, and it's contagious! Everyone in the South Okanagan, including the 6,943* in Osoyoos a 20 drive minutes away, travels to Oliver for live theater, to watch blockbuster movies, to wine and dine, and to join in community together. NK'Mip Canyon Desert Golf Course hosts a variety of fun and exciting events and tournaments throughout the year. Discover how you can take part or support friends and family. Come play through the spectacular vineyard, sage and stone vistas and watch the sun play tricks on the mountains. While here, try a Golfboard, because Nk'Mip Canyon is one of the only courses in Canada to carry them! For $45,000, plus an annual fee, you may purchase a membership. The 300 individual memberships and 10 corporate memberships are sold out, so reach out to the club to get on the waitlist! "It's for gearheads like me, with cars like this, that need somewhere to have some fun, take these cars to the limit, which is what they're all about, and that's what they love to do. These cars, they don't like driving in traffic. They want to be driven fast and hard, and that's why we're building it." The best way to describe the experience of skiing in Oliver is the words of the people who live it! "The thing that was magical about coming here was, it seemed like a secret. Unless you knew it was here, you were never going to trip over this place." "The mountain we were at was a little bit too big, and crowded, and sometimes dangerous, and we wanted to come to a mountain that was chill, you know with enthusiasm, so I felt that special vibe [at Baldy]." "I remember the moment I fell in love with Baldy. It was sunshine and powder!"